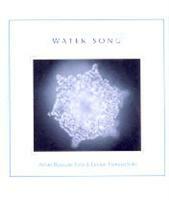 (Ryusuke Seto/ Hanayo Seto) This music was created by Dr. Emoto's idea and original lyrics were written by Dr. Emoto. His spiritual friend, Ryusuke Seto made music for the song and his daughter, Hanayo sings the song. It is truly beautiful music with beautiful lyrics singed by beautiful voice of Hanayo and the water that listened to the song portrayed the core shape of "Love and Gratitude" and the crystal branches that branch out with perfect symmetry that can hold the whole with kindness. From vibrational point of view, this song will heal people who have problems and stress in their relationships with people. Take a deep breath as you listen to this song as it will bring calmness. Hardcover, 2CD set and 60 full-color pages, 8” x 10” From the New York Times best selling author of The Secret Life of Water, a two CD collection of classical music proven to aid in physical and emotional healing, accompanied by a book of commentary and the author’s signature water crystal photographs. Masaru Emoto’s beautiful high-speed photographs capture water at the precise moment it freezes—and his scientific research demonstrates how words, music, and thoughts can influence the structure of its crystals. Since seventy percent of the human body is water, the therapeutic implications of his discoveries are far reaching. By correcting distorted frequency vibrations in cells, music with the appropriate rhythm, tempo, and melody, combined with visualization and meditation, can ameliorate joint and back pain, improve the functions of nervous, circulatory, lymphatic, and immune systems, and correct negative emotions such as anxiety and obsession. 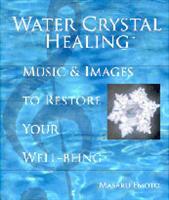 The combination of images, works, and music in Water Crystal Healing concentrates consciousness as never before, providing powerful and lasting healing effects. This CD was the first of its kind, proving in a laboratory that music can indeed be scientifically created for therapeutic application. It is a musical blend of various acoustic instruments, featuring cutting edge recording technology and top studio musicians (as is applied to every proceeding recording by Alan Roubik). 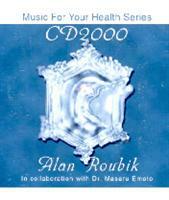 Also known as "HADO MUSIC SERIES 1"
WATER CRYSTAL PHOTO FEATURED IN MASARU EMOTO'S "MESSAGES FROM WATER, Vol 1"
Music For Your Health Series (Alan Roubik) For relaxation, stress & anxiety Relief This is the first recording ever to have been approved by the Home Shopping Network legal department supporting claims that this CD is in fact therapeutic, and proven to help reduce stress and anxiety. Recommended by doctors, psychologists and therapists worldwide. 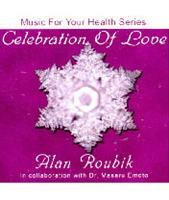 Music For Your Health Series (Alan Roubik) For relaxation, stress & anxiety relief. 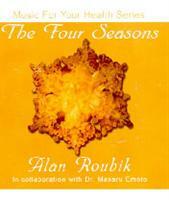 This is a piano solo recording of Alan Roubik's original music. Each song on this CD was tested for very specific therapeutic applications, including sleep aid, relaxation, and stress relief. Laboratory testing indicates that each song contains healing properties that affect several different vital organs in the human body. 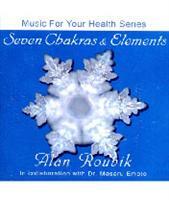 Featured in "The Secret Life of Water"
This CD set represents the true spirit of the Seven Chakras system. The "Seven Chakras" is a rhythmic, non-musical representation of the Seven Chakras system. "Elements" is a musical variation based on the same principals and rhythmic foundation of "Seven Chakras". Each song was created with very specific Chakra guidelines, including frequency, key, Hz and other relevant and determining factors. 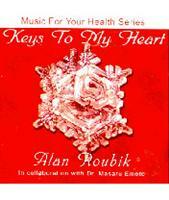 Music For Your Health Series This 2-CD set includes full instrumental (CD#1) and solo piano (CD#2) versions, which are great for relaxation, massage, romantic encounters, weddings, hypnotherapy, and more.